.Report has it that despite directive from the national leadership of the Academic Staff Union of Universities (ASUU) that all its members should embark on an indefinite strike last Monday, the Obadfemi Awolowo University (OAU) chapter of the union is yet to comply with that directive and may never be part of it. According to a circular shared by an online user and said to have emanated from the management of the university, students have been asked not to vacate the campus as academic activities for the remaining part of the 2017/2018 session is very much on course and there is no intention to end academic activities until the end-of-year Holiday. 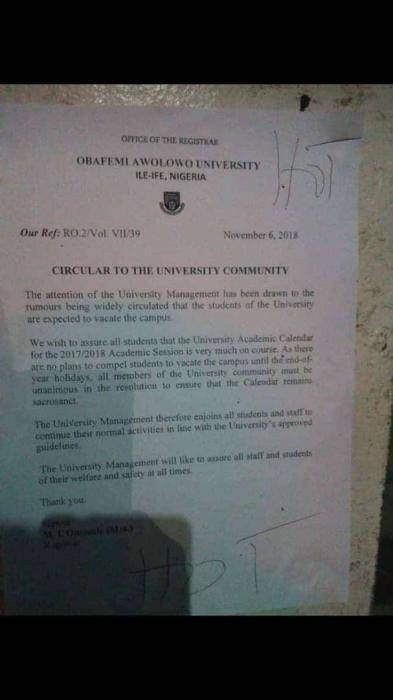 The circular equally enjoned both staff and students of the university to continue their normal activities in line with the university’s approved guidelines and ensure that the Academic Calendar remains sacrosanct.. Started by SchoolBoy How About Your School? Started by NewWorld How About Your School?